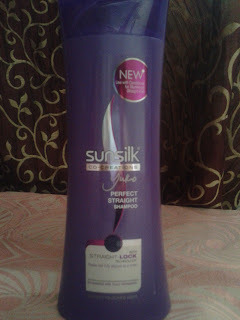 Today I'm reviewing sunsilk co-creations Perfect Straight shampoo. Though i am not very much fond of sunsilk shampoos, i got this one as i was attracted to what it claims. Advanced straight lock technology formula: , Penetrates deep within the hair the hair fibre, reducing frizz and straightening strands, keeping them fully aligned as they dry*. Results that have to be seen to be believed. It comes in a curvy cylindrical violet colored packaging, looks stylish and sturdy. The product details and functions are mentioned on the bottle. Ingredients, directions to use, specialties are mentioned at the back of the bottle. I like its fragrance, its has a very nice mild fruity fragrance and the shampoo is pale white in color with a hint of blue. It claims to make your hair perfectly straight and aligned by making smooth and reducing frizz. But in person it does not make your strands really straight, though the shampoo is quite fine for the regular use but it doesn't make any sense with what it claims. So, i am not very impressed with it, else if you want it for a regular use, No issues with it. P.S_ Everybody has a different hair texture and it depends genetically. Rebonding is an option for a temporary straightening but it is extremely damaging. Best is to condition your hair regularly by using home made remedies and let your hair beautifully in its own texture.